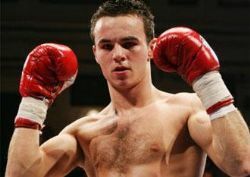 West Ham's Kevin Mitchell believes he is ready for a world title fight following his latest victory over Breidis Prescott. That convincing points success earned the unbeaten 25-year-old the WBO Inter-Continental lightweight belt, and he is now the No 1 contender for the world belt. Mitchell takes on Colombian Ignacio Mendoza at Wembley on Saturday night and he expects victory will earn him a world title shot later this year. "If Amir Khan can get a world title fight two fights after a loss, and I'm unbeaten at 25 years of age, I'm more than ready for a world title fight," he told Sky Sports News. WBA light-welterweight champion Khan has left Frank Warren's promotion team as he seeks exposure in America, but Mitchell insists he will show more loyalty to the man who has led him throughout his career so far. "I've been with Frank for seven years now. One day I will be a multi-millionaire, I will want to go abroad and be a world champion and me and Frank will go together," he added. "He guides people's career perfect, he does things right and I'm good friends with Frank."